High-water is here. Freestone rivers across Montana are running muddy and are looking to stay that way for the foreseeable future. Best to leave those rivers to the whitewater crowd and head elsewhere to get your fishing fix. 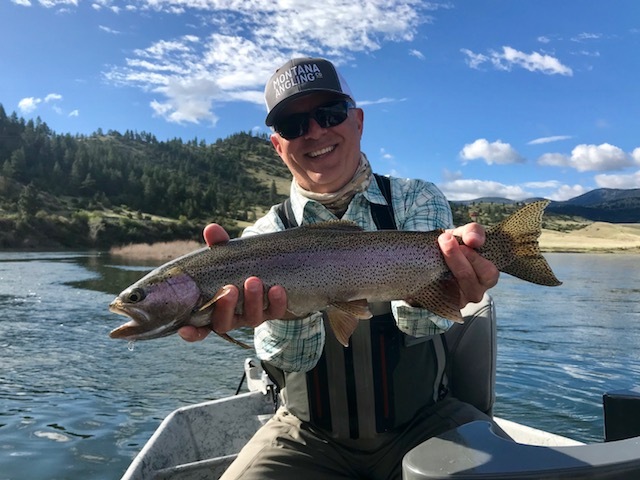 Near Bozeman we’ve got some great options and fishing has been solid. Look to fish the Lower Madison, Upper Madison, the Paradise Valley Spring Creeks, and area lakes for anglers wanting to stay local. For those willing to travel: head to a nearby tailwater. The Missouri River has provided the most consistent fishing in the state since mid-March and looks to continue to. Flows are high, rising trout are few and far between, but the nymph bite has made for lots of stellar days. Where you will (mostly) find our guides now through the end of June. Flows are at 13,700 CFS. We expect it will get bigger, and that’s just fine. The fly fishing has been rock-solid since mid-March. Big flows mean lots of food and trout on the feed. It is a sub-surface all-you-can eat buffet of sowbugs, scuds, worms, mayflies, and caddisflies right now. Despite good hatches of midges, BWOs, and soon to be caddisflies, it has been pretty quiet on the surface. There is too much subsurface food and too deep of water for fish to rise in good numbers. It will be mid-late June before we’re back on top. For now, deep nymphing has been the best game in town, and it has been nothing short of great. Lots of happy anglers the past few weeks. Find the soft water, get your flies down, and set on everything. Or contact us to book a day of guided fly fishing. The best local float fishing option for anglers in Bozeman. Both the Lower Madison and Upper Madison are running high, but fishable. And fishing has been good. High-water meant not as many rising fish for the mother’s day caddis hatch as we would have hoped to see, but plenty of fish to be caught on the dryfly for those willing to hunt for them. Nymphing with high-water junk (worms, crayfish, stoneflies, flashy/bright/hotbead nymphs) has been the most consistent producer and we’ve seen some good fish coming to the net. Target deep, slow water: fish like it’s winter when the rivers are high. And be sure to look around and enjoy the green in the hills and valleys. You’ve got to love spring in Montana. Maybe the last great wade fishing options in the state. Clear water and safe wading flows aren't easy to find. The bulk of our spring creek guiding has been on DePuy’s Spring Creek. We’ve seen the early spring hatches of midges and BWOs start to wind down. On cooler, overcast, or even rainy days the BWOs will show. Last week it wasn’t until 2:30pm that they did. We had light rain, cold weather, and a 3-hour window of spectacular dryfly fishing during a BWO hatch. Caddisflies are around, if you fish one well they might even eat it. Nymphing the deeper, faster runs has been very productive. Midges, scuds, caddis pupa, and PTs have all gotten it done. Break out the 6x tippet and make your first cast count. More of the same for the near future. There is still a lot of snow in the mountains. We’re hoping to be on the Yellowstone River the last week of July, but it could be the first week of August. A lot can also change between now and then. If it stays warm the freestone rivers may fish sooner. Cold and rainy weather would mean later. Yellowstone National Park opens to fly fishing May 26th. Early season fishing on the Firehole River is some of our favorite of the year. Fishing on the Missouri River will remain great through the summer. High-water tactics i.e. nymphing will be your best bet through mid-late June. Same goes for the Madison River. We’re counting down the days until Salmonflies start to fly. PMDs on the Spring Creeks are just around the corner. Rod availability is very limited already, if you’re interested in fly fishing the Spring Creeks with us in June or July, give us a shout sooner rather than later. 2018 is shaping up to be a great year to fly fish in Montana.